"Exotic Sezincote! 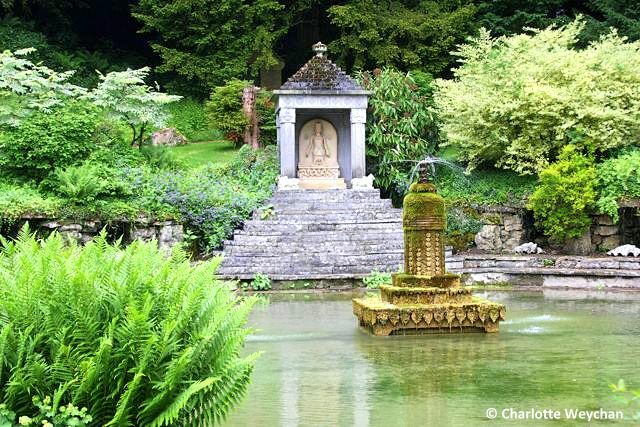 Stately and strange ..."
In the large ambience of a country house...exotic Sezincote! This is how Sir John Betjeman described the unique property near Cheltenham in his verse autobiography "Summoned by Bells". He used to come here for lunch during his time as an undergraduate at Oxford. And it's certainly one of the most unusual gardens I've visited - with its striking Moghal-style architecture and lovely gardens, well worth making the effort to get to, despite it's restricted opening hours - just two afternoons a week. The house (top) - with its onion domes, minarets and peacock-tail arches - and the pavilion were designed by Samuel Pepys Cockerell for his brother Sir Charles, who worked for the East India Company. Completed in 1805, it was the inspiration for the famous Brighton Pavilion, following a visit by the Prince Regent to Sezincote in 1807. The original gardens were landscaped with input from Humphry Repton, the lesser-known, but more flexible successor to Capability Brown, who helped Samuel source sketches for classic Indian gardens. The classic chadar bagh (top) featuring trees and ponds in front of the house and the pavilion were added by former owner of the property - Lady Kleinwort - in the 1960s. 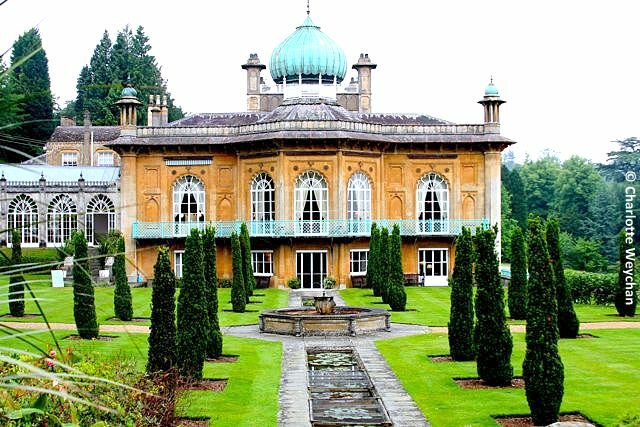 Located near the glorious, but touristy towns of Stow-on-the-World and Moreton-in-Marsh, where you expect to find honey-coloured stone buildings, Sezincote comes as a real surprise because of its marked Indian influence and unusual gardens. The property is approached by an avenue of holm oaks, and over an ornamental Indian bridge - complete with two pairs of Brahmin bulls (above) - overlooking the Snake Pool, which takes its name from the three-headed serpent intertwined with a dead tree stump and the magnificent water gardens (below). The original garden lies to the north of the house and features a chain of inter-connecting pools and streams, lushly planted and fed with water from the top pool with its temple dedicated to the Indian sun god, Surya (below). It was a dull and damp day when I visited, but this didn't detract from the glorious planting and serenity of this magnificent garden. Everywhere you look, there are large-leaved aquatic plants, together with weeping beeches and willows. 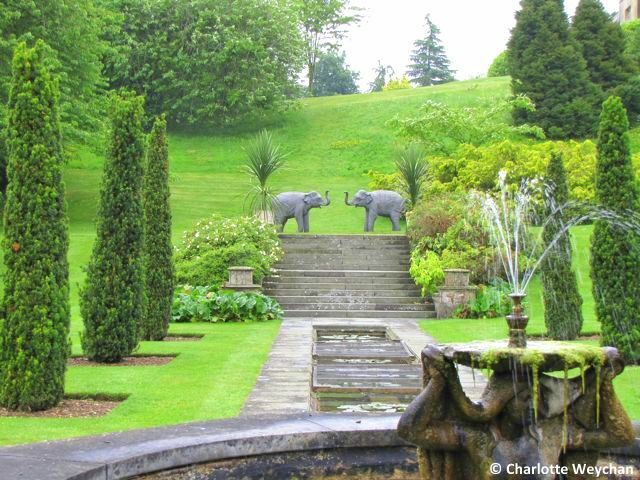 The house and garden, like so many others in the area, suffered neglect during World War II, but was brought back to life by Lord and Lady Kleinwort, who purchased the estate in 1944 and started restoring it to its former glory. Today the property is still lived in by their descendants and serves as a family home, but is only open to the public on Thursdays and Fridays from 2.00 - 6.00. 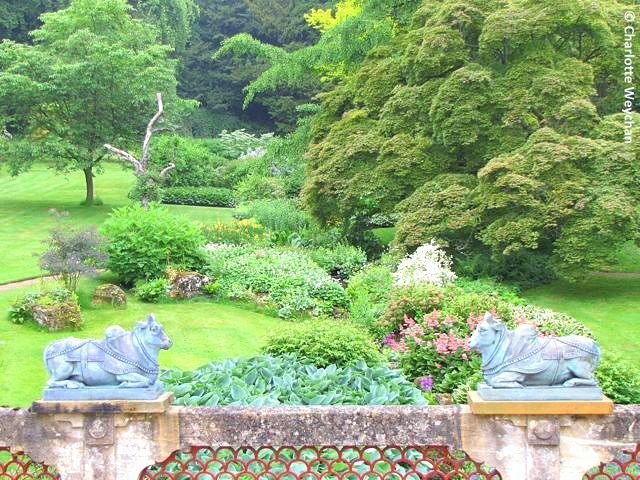 Other notable gardens nearby include Hidcote Manor, Kiftsgate Court, Snowshill Manor and Sudeley Castle. I would like to visit this unique property. Reminds me of Taj Mahal. I visited Sezincote about 5 years ago, and your beautiful photographs brought it all back to me. Just lovely! 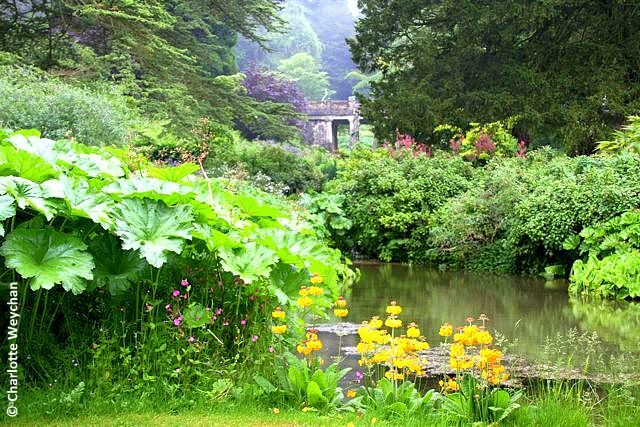 I will try to include a visit to Sezincote and the other gardens you have mentioned when I eventually make a return trip to the UK.